Springs are a crucial component in any garage door system. They’re necessary for the smooth, safe operation of your door, and help to keep it from slamming shut dangerously. However, although these components are manufactured to a high standard and are designed to last, they will gradually wear out, and will eventually break, causing your door to become inoperable until they’re replaced. Dealing with these units can be dangerous, so you should always let a professional handle them rather than trying to do so yourself. There are two types of springs your door can use, but both types have a similar role, which is to support and counterbalance the weight of the panels. 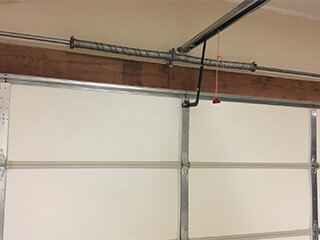 The torsion spring is often preferred for its flexibility and durability, but some cases, like a garage with a low headroom clearance, will require going with the second option. Extension springs require a certain amount of backroom space, but not headroom. Their downside is their reduced durability and the fact that because of the way they work, they are more likely to whip around when they break. Why Do These Units Wear Out? No matter how tough your garage door springs are, the strain of lifting heavy panels every day eventually takes its toll. However, it is possible to minimize the impact this has on these units. By carefully lubricating them and regularly cleaning them, you can extend their service life significantly. Typical extension springs can last anywhere from 3,000 to 7,000 cycles, depending on how well they're made and how often you use your garage door. This might mean just a few years of use or more than a decade. Torsion springs will last longer, but they too will eventually need to be replaced. Be aware of how these units are, and watch for the warning signs – a wobbling, sagging or swaying door is often a dead giveaways that they are growing weak. We understand how urgent it can be to get a problem with these parts fixed, which is why we offer emergency same-day spring repair services. Whether you’re in need of a checkup or urgent assistance, get in touch with our team at Garage Door Repair Los Altos and we'll send our experts over ASAP.